Most of us have seen robots like Terminator in Hollywood movies, which are unrealistic and will take hundreds of years in development. 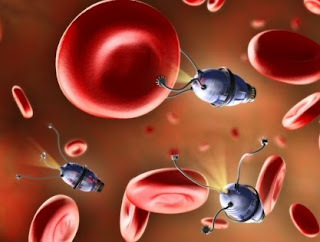 But very soon nanotechnology will deliver nano-robots, which will be future of medicine. Development and testing of nano-robots is going on and very soon it will be released in market to cure some fatal diseases. Nano-robots are sometimes also called as nano-medicine or nano-particles. It will revolutionize the way we detect and treat diseases, as it will do detection and treatment at cellular level. There are one millon nanometer (nm) is one millimeter (mm). Nanotechnology deals with objects in size range of 0.1 nm to 100 nm. Such small size gives nanotechnology the ability to enter into human body and travel through blood vessels to reach a target site easily. Size of RBC (Red Blood Cells) vary from 6200 nm to 8200 nm, which is far more than size of objects made through nanotechnology. Very small size of nano-robots will provide it freedom to penetrate anywhere in body, just like blood can go anywhere in body. It will work at cellular level to treat diseases. Nanoparticles are being developed at Georgia State University, which will target influenza viruses and will be an effective treatment of the disease. Usually medical science don't have any effective treatment against viral disease (they just treat symptoms) , but if this nano-medicine succeeds then it will be a major breakthrough. Some labs are designing and testing nanoparticles that can deliver drugs, heat and light to specific cells in human body. This technology can be used for chemotherapy of cancer cell without disturbing other healthy cells. It will greatly reduce side effects of cancer treatment and will be effective to fight against cancer. Researchers at the Wyss Institue are testing nano particles that can act according to pressure inside a blood vessel. At the site of blockage inside blood vessel, the pressure is increased, which can make a nanoparticle release the medicine at the site and dissolve the blockage / clot. Researchers at the University of Illinois are using gelatin nanoparticles to target brain injuries and deliver drug directly to damages brain tissues. It will be most effective treatment for brain injuries. Houston Methodist Research Institute is conducting a research using silicon nanoparticles to target cancerous tumors and deliver drugs directly inside them. Good news for those who are fearful of injections. Such nanoparticles are being tested on mice which can be taken orally and then they will pass through lining of intestine into the blood stream and then deliver the medicine there. Successful testing of this technique will help you in taking vaccinations orally. Nano-capsules are being designed to carry insulin and then release it only when blood sugar level rises. Why Nanomedicines are better than traditional medicine ? The good thing about nono-medicine is that it is actually nano-particles that carry traditional medicines. Old traditional medicine approach targets a wide part of body with the medicine, while it is necessary to target only a specific area suffering with disease. In nano-medicine approach, the nano particles first find the target area inside the body and then release the medicine at that particular place, which treats the medical condition effectively. It also saves our body from side effects that traditional medicine causes by approaching healthy cells of body. Thus nano robots will not only treat diseases easily, but will also reduce side effect. Medical science is going to revolutionize is a few decades and a number of fatal diseases will be cured soon.